5 Essential Planning Steps for a Successful Warehouse Label and Sign Installation | ID Label Inc.
Demand for warehousing space is at an all-time high, driven in large part by a boom in retail e-commerce sales. If you’re in the process of planning a new warehouse or distribution center or expanding your current facility, there are a several key preparation steps to keep in mind to ensure that your warehouse labels and signs meet your needs and your go-live date. 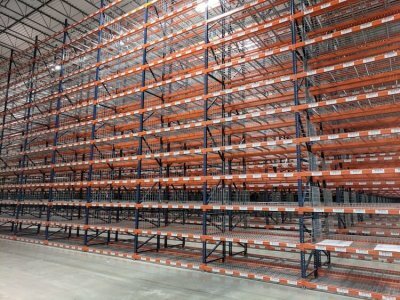 Make sure your racking and facility are ready for labeling, including clean racks and clear aisles. Don’t wait too long to plan for your barcode location labels and signs. Poor preparation might lead to errors, rush production charges or delays in your go-live date. Include ID Label on your project team to manage all the aspects of label and sign preparation and installation. This allows you to focus on other critical project components. Racks and beams should be clean and ready to be labeled. Dirt and dust can quickly accumulate during storage and installation, which can significantly diminish a label’s adhesive values. What scanning technology will be used? From what distance will your labels be scanned? What kinds of surfaces will the labels be applied to? Will the labels be used in cold or freezer environments? Do your rack labels need to accommodate wire-deck hangover? Will you run an up or down picking operation? 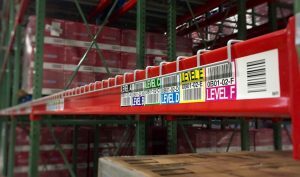 Will you use vertical location rack labels? Analyze your floor plan and layout to determine how many bulk storage locations there are and how you will identify those areas. 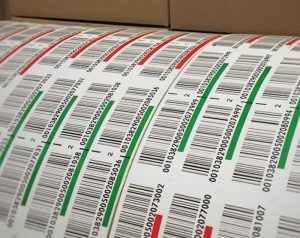 ID Label typically recommends using long-range scanners and overhead retro-reflective hanging signs with barcode images. They come in a wide variety of designs and materials, including angled and double-sided. PVC signs are sturdy and tend to work well in typical warehouse environments where open dock doors can increase air flow. Durable floor plate kits are another option to consider, especially when long-range scanning is not an option. Clean Racks – Racks and beams should be clean and ready to be labeled. Dirt and dust can quickly accumulate during storage and installation, which can significantly diminish a label’s adhesive values. Equipment Access – Understand what type of equipment can fit in the aisles to reach upper-level racks. Power Availability – Active electrical receptacles should be available to power lifts and booms. If not, portable generators will need to be rented. 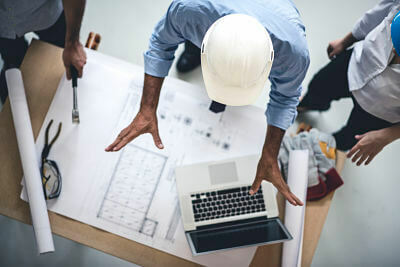 Facility Access – Confirm what time of day personnel or installation vendors have access to the facility. If access is limited to evenings or weekends, this can impact installation staffing requirements and costs. LPN labels will be a vital part of your new facility to efficiently identify pallets, cases, cartons, totes and other moveable units. Preprinted LPNs are typically less costly than labels printed in-house. 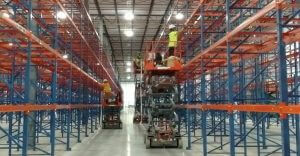 They also meet the needs of today’s automated smart warehouses that demand greater efficiency, speed and productivity. Set up your preprinted LPN labels in conjunction with the implementation of your WMS system to ensure you hit the ground running on day one. ID Label offers a “Make-and-Hold” quarterly inventory program that helps lower costs even further while also providing same-day shipping on your next quantity of sequential LPNs. 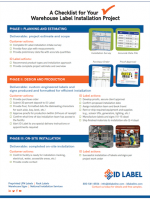 Download our free checklist to learn more about preparing for your next warehouse or distribution center label installation project. 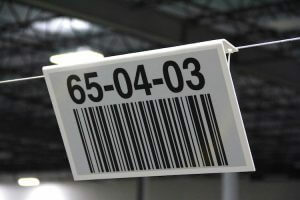 ID Label manufactures extremely durable warehouse rack and bin location labels. Our materials have been tested and used in warehouse operations around the globe. We also provide warehouse signage and turnkey nationwide installation services to provide a complete solution to our many clients who rely on us for all their warehousing needs.